Remember When Trans Fats Were Supposed to Be Good For You? Not so long ago, it was near impossible to avoid trans fats—more widely known in food ingredient lists as partially hydrogenated oil. Trans fats, which were processed to mimic saturated fat, were found in almost all the cakes, cookies, pies, pastries, and potato chips we bought in supermarkets and chain restaurants. But late last year, the Food and Drug Administration declared that trans fats are no longer “generally regarded as safe.” The introduction of any new food product that contains more than trace amounts of trans fats now requires explicit FDA approval. We foolishly thought that our experiment to improve on Mother Nature’s options for fatty food and replace saturated fat with “healthier” trans fats was a win-win. But trans fats have turned out to carry some of the same health risks as saturated fats, and it has taken an unfortunate amount of time for that to become clear. Trans fats don’t have to be artificial—some are also found in nature. Bacteria in cows and sheep are known to create trans fats that appear in the milk we drink and the mutton we eat. But for 94 percent of human existence, we consumed small amounts of trans fats. Even after the domestication of cattle, our consumption of natural trans fatty acids did not typically exceed half of 1 percent of daily calorie intake until modern times. Creating the trans fats we typically think of involves chemically processing an oil with acceptable health characteristics (such as cottonseed oil) to make it mimic saturated fat. In 1901, a German chemist discovered that exposing polyunsaturated oil to a metal catalyst made it denser. This property caught the eye of Crisco, and the company introduced a special kind of shortening in 1911—the first American food product to include industrial trans fats. 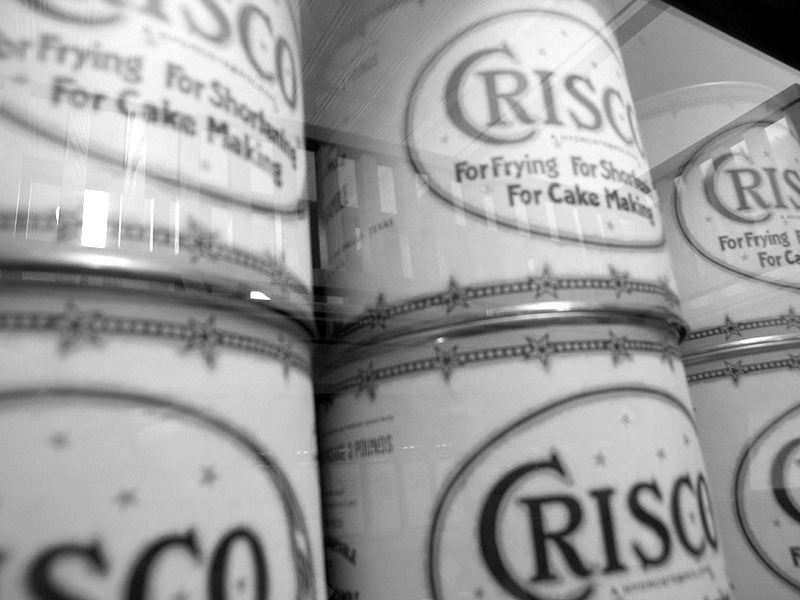 Crisco’s shortening is semi-solid at room temperature, and the oil remains stable when used for deep frying, which made it appealing to cooks and food manufacturers. It gave food a longer shelf life and cost less than butter, lard, or tallow. Not only that, a pie made with Crisco lacked the animal flavors you might find in one made with lard or tallow. Trans fats began to appear in baked goods in the 1920s but really took off during World War II, when lard was scarce and expensive. Margarine replaced butter—and manufacturers embraced trans fat as a cheaper and more desirable alternative to saturated fat. Trans fats then got a boost from the medical community. In the 1980s, health authorities responded to the results of studies such as the Seven Countries study of heart disease by urging Americans to reduce their intake of saturated fat to minimize the risk of heart disease. In one of history’s greater ironies, the Center for Science in the Public Interest lauded fast food companies in the early 1980s for replacing heart disease-risky saturated fat with trans fats made from what they described as “heart-healthy” polyunsaturated fats. By 1989 more than 10,000 food products sold in the U.S. contained trans fats. In the early 1990s, 95 percent of prepared cookies and 100 percent of crackers manufactured in the U.S. contained trans fats, according to FDA estimates. Then scientists discovered alarming health effects of trans fats. In one clinical trial, the people who consumed trans fats had significantly higher levels of LDL-cholesterol (the “bad cholesterol) in their blood and lower levels of HDL-cholesterol (the “good” cholesterol), both reliable predictors of cardiovascular disease. Trans fats consumers showed even worse cholesterol levels than those who consumed similar amounts of saturated fat. Other studies revealed additional negative health effects. When trans fats were substituted for saturated fats, inflammation increased lesions in artery walls; trans fats also increased stiffening of the arteries. In 1994, epidemiologists estimated that 30,000 cardiovascular deaths per year in the U.S. could be attributed to the consumption of trans fats. That same year, the Center for Science in the Public Interest did a complete about-face. They petitioned the FDA to require that food products containing trans fats include information about the amount per serving on the label and urged the public to limit its intake. In 1999, the FDA announced that food product manufacturers had seven years to reformulate their products and list the trans fat content on labels—or at least the labels on any product with 0.5 grams or more. By 2006—when those labels first began appearing on products—the damning evidence against trans fats now included 12 clinical trials, one of which suggested that eliminating industrial trans fats from the food supply could prevent at least 72,000 heart attacks and strokes every year. U.S. food manufacturers initially opposed FDA regulation of trans fats on the grounds that trans fats had been used for decades and were generally regarded as safe. But they began reformulating products anyway because of the bad press. Since then, manufacturers have reduced or replaced the trans fats in thousands of products—mostly energy-dense and nutrient-poor foods such as cakes, cookies, pies, pastries, and savory snacks. The McDonald’s baked apple pie, for instance, no longer uses trans fats and instead uses palm oil, a tropical plant oil with levels of saturated fat that are unusually high for a plant-based oil. But we are mistaken if we think eliminating trans fats from American food products will result in a significant reduction in obesity-related diseases like heart disease and diabetes. We won’t see the results we’re hoping for until we change how and what we eat. As any parent of a vegetable-rejecting child knows, it can take time to learn to like fruits and vegetables. My diet in college was heavy on cheeseburgers, French fries, ice cream, and pizza, with maybe a piece of fruit and a few vegetable servings. Over time, I’ve trained my body to prefer a healthy lifestyle. I eat six servings of fruit and six or more servings of vegetables every day. Now, even a single potato chip makes me feel queasy. Eating this way takes time—about 30 minutes to prepare dinner each night, plus three trips a week to the grocery store for fresh produce. Based on a sophisticated measure of my heart functioning, my current biological age is 27. (My real age is 62.) At this point, I’m addicted to the DASH diet, which calls for eight or more servings of fruits and vegetables combined a day. It may be the one addiction that is unequivocally good for you. And it contains negligible trans fats. William J. McCarthy is professor of public health and co-director of the Center for Population Health and Health Disparities at the UCLA Fielding School of Public Health; he once worked for the Quaker Oats company. His current research includes a three-year trial to compare the traditional calorie-counting approach to weight control with the new high-fruit, high-vegetable MyPlate.gov approach (based on the DASH diet). *Photo courtesy of Heather Ingram - Photographer. diet, fat, Food, health, obesity, public health, Thinking L.A.